Though businesses are moving online, their identity verification and KYC processes haven’t. Instead, the old processes are being shoehorned into the digital age. So how can you update your onboarding for the digital age? The move towards responsible gambling and stricter regulations means knowing your customer is more important than ever. But for operators, that’s easier said than done. Guidance is unclear – so what CDD measures do you need to perform and when, and how do you do it without scaring off your customers? In collaboration with iGaming Business. What should be on your checklist when implementing biometric solutions. -What are the problems with current methods of identity verification? -How can a hybrid human-AI approach mitigate common risks? -How will we be able to use our identities in future? -What are the benefits of biometrics, machine learning, and facial liveliness? -Where does blockchain come into play? Watch product demo to see the latest and greatest from Onfido. During the session we'll showcase our product in action, showing you how our AI-based technology can safely and smoothly verify identities in seconds. - How our SDKs, APIs and dashboards work on web and mobile. - What a frictionless verification process looks like for your users. 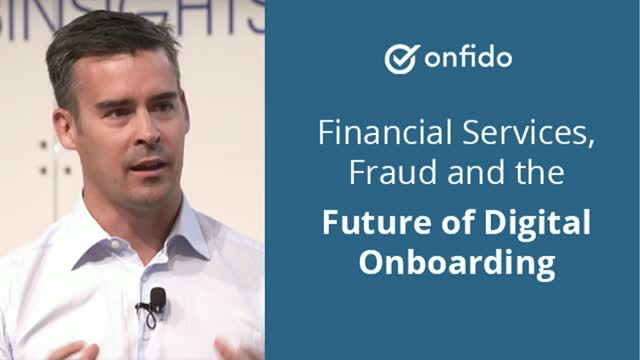 PYMNTS CEO Karen Webster and Kevin Trilli, chief product officer at Onfido, discuss the current trends in fraud techniques, and reveal how risk and fraud managers can utilize new technologies to catch them. When it comes to user onboarding, there’s a tension between security and convenience. For financial services, non-compliance with KYC requirements can be costly. But adding too much friction will impact your ability to scale. So how can you optimise your user experience to introduce just the right amount of ‘friendly’ friction and unlock growth? This session is part of Digital Transformation in Financial Services -- a BrightTALK Original production. Identity theft is the fastest growing crime in the USA, and different regions are feeling the repurcussions as well. It’s obvious that traditional ways of proving our identities are no longer secure. So what are financial institutions doing about it? Hamstrung by outdated legacy systems and increasingly stringent regulations, traditional financial services are struggling to keep up with consumer expectation and the demand for digital transformation. Kevin Trilli is Chief Product Officer at Onfido. Previously, Kevin served as SVP of Product at Data Privacy Management company TrustArc. Kevin has over 20 years of product and entrepreneurial experience in digital data security, privacy and governance, having led the full process from strategy to execution to scale at companies including VeriSign (acquired by Symantec), TrustArc (formerly TRUSTe) and AssertD. He leads the strategic evolution of the Onfido product platform. Identity fraud cost the United States $16.8 billion in 2017. For Financial Services, the issue is acute. Thanks to a recent spate of data breaches, SSNs and other traditional identifiers are no longer fit for purpose. But without identity verification, new customers can’t be onboarded. Increasingly strict KYC and CDD regulations are raising fresh challenges. Add too much friction, and the user experience suffers. New solutions will need new thinking – and new technologies. Erik Wilgenhof Plante, Chief Compliance Officer at Bequant Capital, a crypto currency broker, talks us through financial crime investigation in blockchain. What are the challenges facing Compliance teams in Financial Services, and how can compliance professionals balance the pace of innovation at a FinTech against the demands of the regulators? Curve's Rona Ruthen and Alison Moore share their experiences at Onfido's latest Comply Coffee Morning.